Greyhound temperament is what allows a greyhound to be the ideal house pet. One would think that with the way they have been raised that they would be anti-people, but the opposite is normal for the majority of them. Greyhounds go from the breeder’s farm to the trainers when they are weaned from their mothers. The trainer will instruct them on the fine art of chasing a mechanical lure. The fast ones will then begin their racing career usually around the age of 17 months. Their lives then consist of a crate, the turn out pen, the race track and trucks ferrying them from track to track. Because of the greyhound temperament they adapt to the role of “pet” very quickly. Usually within the first week of having a new greyhound in our home they fall into the routine of daily home life as if they were made for it. Greyhounds are very accustomed to strict regimentation and keeping a schedule of activities gives them a sense of comfort. Don’t be fooled by some of the odd behavior you may see in a recently retired racer. Some will turn to stone at the sight of a linoleum floor; my Murphy was a statue when we took him to PetSmart for a Meet and Greet. They have never experienced a shiny surface that is slick under their feet. Being on a surface that causes their feet to slip is very frightening. Remember your first pair of roller or ice skates? The same feeling occurs when they feel their feet beginning to go in the opposite direction of where they want to go. Sliding glass doors are a new experience for them also. I remember one of our greyhounds bumping their head on the door and even when the door was open refused to go through it. I had to hold his collar and walk him gently through the open doorway. After that I put some dog height stickers on the door. OK I have them at People Height too because I walked into the thing myself. Once they understand the mechanics of these devices there are no further issues—for me too. It is often said that greyhounds are “40 Mile an Hour Couch Potato” and that is so true. They love nothing more than to snuggle next to you and watch the tube. When we adopted Mr. T, he was so grateful to be out of the previous house full of screaming kids that he would hop on the couch with me after dinner and put his head on my arm. You don’t have to be a Dog Whisperer to understand the look he was giving me. The night he had his stroke he was on the bathroom floor and could not get up. I spent the night with him there not leaving his side; he would have done the same for me. There are exceptions to every rule and I have seen greyhounds that don’t fit the usual greyhound temperament mold. Some have health issues which make them cranky. Others will have “flash backs” to very unpleasant experiences which make them fearful. But a dog savvy person will recognize this behavior and adjust to it. 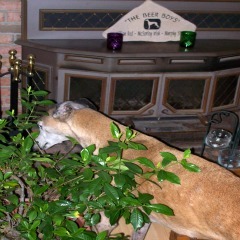 For the most part the greyhound temperament is one of a kind, gentle and quiet pet. They love you with huge amounts of unconditional love and will make you smile every day. Greyhounds are one of the most low maintenance pets, next to the Pet Rock. Rescue groups usually receive information from the track on retired racers as to their behavior with “small animals” or more specifically their “prey drive”. The group will again test the retirees before they place them with a foster family to make sure that they will not come into the house and chase down the cat. The foster family will observe their behavior as they settle into home life. They will be interested in other house pets because they have never encountered anything other than greyhounds and a mechanical rabbit. Being interested and high prey drive are two totally different attitudes. For the most part greyhounds will be respectful of other house pets, the big question is will the resident house pets will accept the new greyhound into the pack? Our cat Stumpy taught the greyhounds all about Animal Planet. Greyhounds are very “people friendly” dogs. At Meet and Greets they just love the attention given to them by people wanting information about retired racers. Spot would go right up to people like Mr. Congeniality and put his head at a comfortable level for being petted. Occasionally some greyhounds that have experienced abuse at the hands of track employees are shy around strangers, but most come out of their shell when they realize that these new people may have a treat for them. My Girls will run to the door when someone comes to visit. They sniff them from stem to stern—checking for hidden biscuits—if they are not “holding” then the Girls go back to their respective beds. “No cookies, then they are useless’ so no unnecessary energy is expended. This is the title of a book written by a Greyt friend of ours, Sheryl Matthys. In this book she explains how your canine friend can steer you into or away from romantic relationships. Strutting along with a majestic greyhound always attracts attention and Sheryl explains how “listening” to your dog will help avoid unfortunate relationships. Nobody knows you better than your dogs and nobody explains it better then Sheryl. People always ask “how are greyhounds with children?” Right away I know they know nothing about dogs. Rather than saying “greyhounds love them stir fried” I tell them that greyhounds are as good with children as the children are with them. Dog savvy people KNOW that children should never be alone with dogs—any dog. Children who are taught to be respectful of dogs and are kind and gently with them will have a wonderful relationship with them, if children are allowed to pull ears, take toys away from them and worst of all, to jump on them they will be reprimanded by the dog. When I see the way some kids treat dogs I tell the parents that if the dog doesn’t bite that kid I will. Remember dogs are not toys they are living, feeling creatures and should be treated with kindness and respect. If you don’t grasp that concept then buy a stuffed animal and stay away from live pets. Just like a war veteran greyhounds can suffer from “flashbacks” from frightening things that have happened to them in the past. My greyhounds become skittish when they hear a garbage truck's compactor. I can only imagine that the sound is similar to the gates on the race track. Others will not go through a confined space or become fearful when hearing loud noises. There is no way to anticipate this behavior. We can only assure them that there is nothing to fear and hopefully they will become comfortable with the situation.